Bright deep pink or pale reddish-purple, 3cm diameter, narrow sepals and petals. Slender, slightly hairy plant with erect flowering stem; very narrow leaf, shorter than stem. Fairly rare in wet places in eucalypt woodlands and high rainfall areas in the north. Fire frequency moderate to high, flowers may last up to 10 weeks if not pollinated. Suitable below powerlines. Orchid seeds are very minute yellow, brown or blackish dust-like particles. Orchid seeds are produced within a capsule that splits at maturity and releases tousands to millions of seeds. Dispersed by wind and water and only germinate following infection of the embryo by a suitable mycorrhizal fungus. Very few seeds become mature plants. 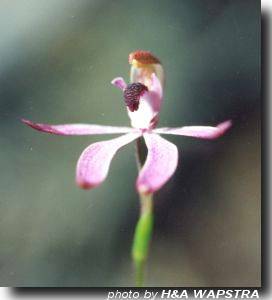 For more information see Jones, Wapstra, Tonelli, Harris (1999): The Orchids of Tasmania.